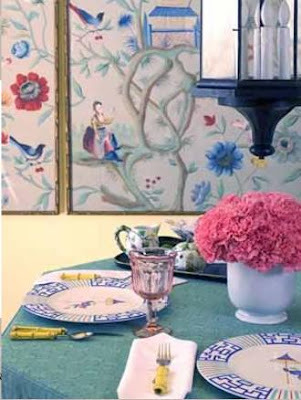 Carolyne Roehm also loves carnations. They really are not all that easy to find in the markets here anymore. I love the fragrance! Thats a great observation...and so true! My latest lipstick would have to be a splurge on soy candle (voluspa) and a great stack of colored paper for notes! Sophie- Really? Down here you can find them everywhere. Although the ones I find don't seem to have that nice scent! Maison- The colored note paper is a great idea! I need to remember that when I next need pads and paper. I knew exactly what I wanted to share & as I scrolled down, I found out it was one of your too - fresh flowers! As usual you have both practical and beautiful design ideas. Thank you! Arlynn- You know, I like irises too, but I don't see them often. Their color is so beautiful, though! Thank you Ellen! I think we've all been forced to be practical lately! I seem to need to be reminded that "it is all in the details" at least once a week. Thanks Jennifer--flowers and note paper--so simple and so true. Don't forget Trader Joe's Orchids--super affordable and they last forever. Oh, I forgot to mention. 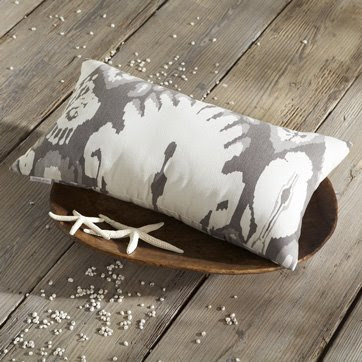 Puppies love to chew on pillows, maybe Alfie shouldn't see the Ikat pillows! Jennifer-A wonderful post. I think in good economies and bad, it is the little details that make a home really lovely. In bad times, these little touches are even more special. 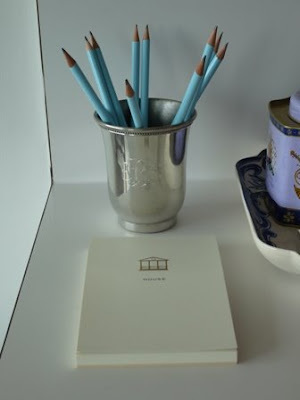 I love the beautiful pagoda candles and diffusers from Seda France, and the notepads and matches from Iomoi for my home. My latest lipsticks? A beautiful coffee cup to use at the office, with a saucer. (Paper cups are so "Mad Men.") Fresh flowers—yes, carnations, so cheap and so chic. These are such wonderful ideas. I would also say all matching new bistro glasses to drink red wine from and feel as though I have traveled to Paris when I have not. I love the pencil idea! Lovely post and so true. I love your little Gucci tray and monogrammed candle. May I ask what line the candle is? It's lovely! Okay, I'm off to buy colored pencils. What a great idea. I'll do a grouping for the kitchen and one for the office. Now I have a use for those pretty old glass candle holders. Thanks! Lovely ideas, but you forgot the chocolate. And don't forget the Alfie updates. All great, doable ideas. Sometimes it's the smallest things that can make me happy. I too love to put my pencils in mint julep cups, but have never thought to coordinate with the room palette! Good point and such nice touches to spread around. My thing is always to have pretty dish towels for a splash of color in the kitchen. I'm always giving them as gifts too, but my family/friends in the States don't hang them up as I do ! Fantastic post! I love the idea. Plus, I have way too many lipsticks. What brand candle do you have there? Personally, I don't care for Seda because the wicks produce black smoke but I love their packaging! Mary- Trader Joe's orchids are cheap and last a while. Good suggestion! Style Redux- I have the Seda France Japanese Quince diffuser. Smells great, but it attracts dust! Aesthete- A cup and saucer is far more civilized than paper! I just need to remind myself of that when I'm drinking from a styrofoam cup! LPC- Oh yes, matching glasses. That's a good one! Yoli- Glad you like the pencils! Paris Hotel and A.- It's a Porthault candle. I can't remember which scent it is, but it's in pink packaging. I adore the scent, and it lasts forever. Karen- I was afraid some people would think the color coordinated pencils are cheesy, but I like them. Courtney- I wish! I have a long way to go to make it semi-chic. Le style- Oh yes, how could I forget dish towels?? I love the French ones from Yves Delorme. Magazines used to be my lipstick, but the good ones are all falling by the wayside! My lipstick purchases-blood orange extra virgin olive oil, cire trudon candles and K Hall diffusers in pomegranate! Handmade marshmellows from local ice cream dream Sweet Republic...one is enough to whoosh the drabs away. Dont forget Costco for flowers too. You can buy a lovely mass of something for reasonable. I found ginger!!!!! Great idea getting monogrammed matches. And I love your Hermès chaine d'ancre ashtray. Do they even carry that one anymore? I had no idea carnations lasted longer...I love that arrangement, the color is Magnifique! Jennifer - not contrived in the least - and fun to see your picks. I think my "lipstick" lately has been paint! My latest 'lipstick' purchase (besides flowers, but that's a must-have!) are magazine baskets coordinated to the rooms in which they are, in mock leather & suede from Madura here in France. Gives me the illusion of controlling the clutter! brilliant post! i love your idea of colour coordinating a bunch of pencils to each room. i'm convinced that details like that are mood stabilizers. ps this post made me realize that roddy's correct. i spend much too much. Love the colored pencils! So stylish! I also love the notepad. Where did you find it? Great post -- love the pencil idea; I too am always scambling for a pen. My lipstick pick-me-up for my home environment is a voluspa or seda france candle. Great post, Jennifer! 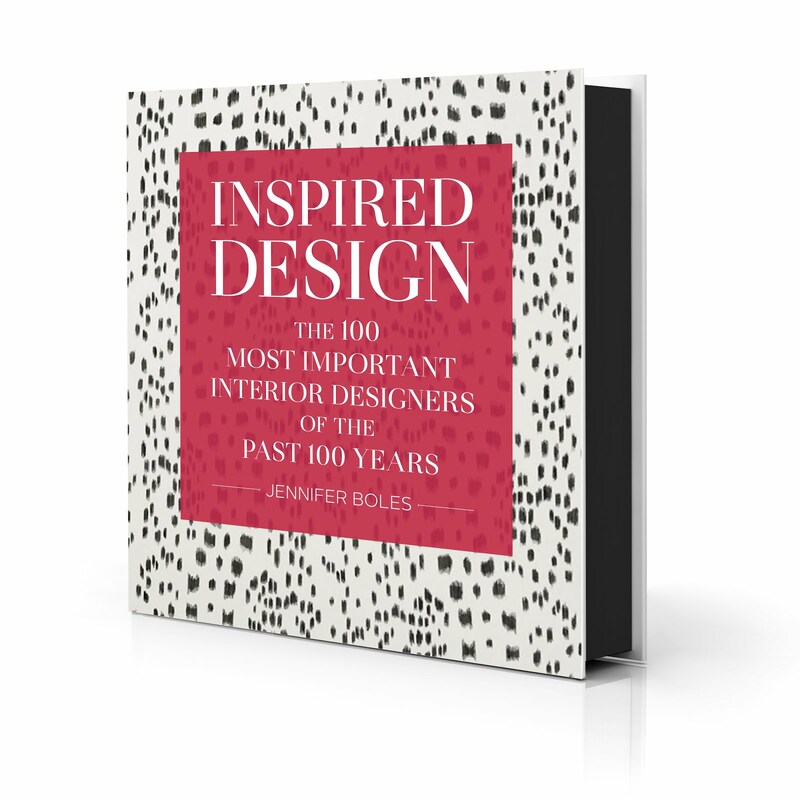 I especially love your "if you're sick of ikat...." mention! Thanks for the reminder that beauty is in the details. Kathryn, the notepad was from Mrs. Strong. Too bad we can't buy them anymore! I love your blog! Thank you for your amazing posts! Do you have ideas for mantels? Funny you mentioned carnations...yesterday I threw away a big bunch (still in fairly good shape) I had for two weeks (and Vancouver weather is unusually hot lately)just because of the stems. My latest treat was a beautiful old framed B&W print of a pointer (my dog) found in an antiques consignement store for 60 dollars. I always indulge in wonderful smelling soaps in the bathroom/kitchen. They're something you'll use so frequently during a day but it's easy to forget their impact. Lily and jasmine scents are my favs! I love the coordinating pencils idea. It is so eye catching. Great job! where did you order the monogram matches from? I just love the idea and have to have some! Eddie Ross is a huge fan of the carnation, One color grouped en mass. I have been painting(the baths, and I have done the wonderful pencils as well. I used to buy fresh flowers for the house, it is a bit of a luxury after purchasing out door flowers though! $20 lipstick is always affordable! Bree- I bought them from foryourparty.com (click on words "monogrammed matchbooks" above and it will take you directly to the product page). One of your best posts ever today (as evidenced by the enthusiastic response and resounding endorsements of all your ideas). Yes, monochrome flowers. No tortured 'arrangements'. Fresh only. 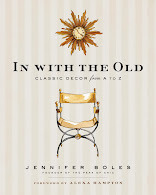 Yes, as Brillante noted, 'antiques' and old books and monogrammed linens from charity shops and consignment shops. Yes, West Elm as a surprise/chic design source. Yes, understated monograms are always classic but not all over the house, or in every room and never aggressively on matching towels. On a sweater or shirt or pillow etc as a kind of joke, with nod and wink, perhaps. Yes, julep cups for all purposes. Happy simple/chic summer to all. Fresh Linens do the trick for me! Love your choices and i am headed over to check out those west elm pillows! Thanks for the tip! I love this! You're a real Jackie O! the pencils - are they monogrammed too? wouldn't that be so adorable. I want to do everything you did. seriously - the pencils, the pads, the matches. I 'm in love. do you have a source? my flower trick is I buy orchid plants - they last two or three months and always look great. I really enjoy your blog...a design blog that doesn't get on my nerves. Thank you so much for the match box details at "for your party". They have exactly what I have been looking for & they ship to Australia! LOVE this idea of lipstick purchases for the home! And I'm doing it for sure--finding fun prints and vintage items on Etsy instead of splurging on that paulistano chair I've been lusting after for a year now...and flowers, of course! They're the best way to make my messy house look 'stylishly lived in'! 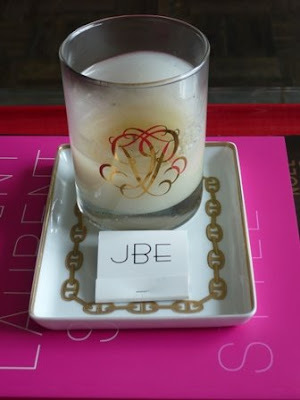 My "lipsticks" are glass oil candles, decorative pillows and towels.